The demon car of Seven Hills Road, the ominous Hell House above the Patapsco River, the mythical Snallygaster of western Maryland--these are the extraordinary tales and bizarre creatures that color Maryland's folklore. The Blue Dog of Port Tobacco faithfully guards his master's gold even in death, and in Cambridge, the headless ghost of Big Liz watches over the treasure of Greenbriar Swamp. The woods of Prince George's County are home to stories of the menacing Goatman, while on stormy nights at the nearby University of Maryland, the strains of a ghostly piano float from Marie Mount Hall. From the storied heroics of the First Maryland Regiment in the Revolutionary War to the mystery of the Poe Toaster, folklorists Trevor J. Blank and David J. Puglia unravel the legends of Maryland. Trevor J. Blank is a folklorist, author and an assistant professor at SUNY, Potsdam. He has a PhD in American studies from the Pennsylvania State University, Harrisburg. He is a native Marylander. David J. Puglia is a PhD candidate and lecturer at Penn State Harrisburg, and he is an alumnus of the University of Maryland, College Park. He is an award-winning author and is the president of the Middle Atlantic Folklife Association. 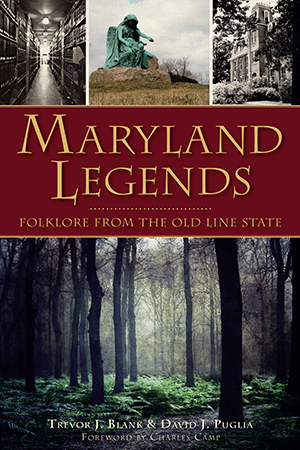 Foreword writer Charles Camp is the retired Maryland State Folklorist. Camp received his PhD in folklore and folklife from the University of Pennsylvania. He is on the faculty of the Maryland Institute College of Art and the Anne Arundel Community College.